It�s a Christmas wreath but it isn�t round. The Holiday Swags are a step away from the traditional circular Christmas wreaths. 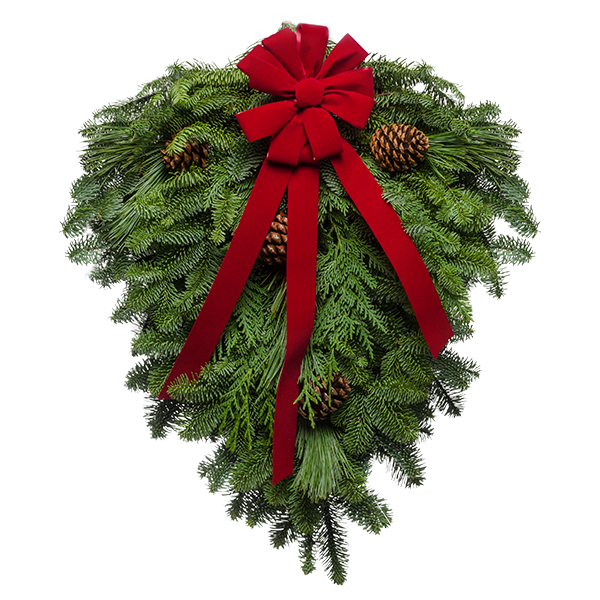 If you are ready for the natural look of evergreens gathered from the forest, you�ll love this unique decoration. It brings the best of the Cascades to your front door. A departure from the classic Christmas wreath design, we create every Holiday Swag from the native evergreens of the Pacific Northwest. The elves gather fresh noble fir, princess pine and western cedar and tie them all off at the top. Then they add pretty pine cones for the finishing touch to make this matchless design. Finally, they add a red velvety bow with long loops which comes packed separately to preserve its freshness. It completes your Christmas front door. These awesome decorations will transport you to the magical forests of the Cascade Mountains the moment you open the box and breathe in the fresh scent of the evergreens. "My gift recipient called to say, 'what a beautiful swag, and perfect in every way, very symmetrical.' The tag on the Holiday Swag said Handcrafted by Sheri, so please let her know how much her work is appreciated."